“Thank you, thank you so much for allowing us to come and join with you on your new year celebration. 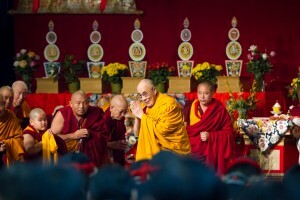 I would like to thank His Holiness the Dalai Lama for bravely coming to Minnesota in this coldest and snowest season. 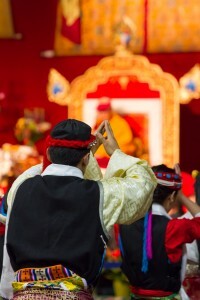 It’s great honor to have you to celebrate the first Losar (Tibetan new year) outside of India here in Minnesota,” Ellison said. McCollum addressed a gathering of around 3,000 Tibetan Americans at the Tibetan new year celebration. “We have much to learn from your wisdom and teaching,” she said. According to the Tibetan American Foundation of Minnesota, McCollum is one of the “most reliable friends of Tibet, and was one of the co-sponsors of the Tibet Policy Act” which calls on the Chinese government to end its crackdown in Tibet, and enter into a substative dialogue with the Tibetan spiritual leader to find a negotiable solution. The newly elected Mayor of Minneapolis, Betsy Hodges officially declared the Tibetan New Year for March 2, 2014, as His Holiness the Dalai Lama’s day of peace and compassion. The Dalai Lama who is currently on a three-week visit to the United States arrived in Minnesota on Friday for a series of events, including an interaction session with a group of Chinese and Tibetan students on Saturday. The Tibetan spiritual leader also gave a keynote speech at the 26th annual Nobel Peace Prize Forum anniversary yesterday in the same city. Tendar Tsering is a freelance journalist based in Minnesota, U.S.A. Previously he worked with several international news portals including ibtimes.com.